Hmm, a New York Times reviewer said about this book, that it has "the stretch of an epic but not the impact of one". And I think I have to agree. It was a long novel, but somehow it was lacking in the oomph that a 700-something-page novel should have. See, this novel is about a boy, named Mevlut, who moves to Istanbul, and for the next years and decades, settles down. He is not the most interesting character, really. He is rather timid, doesn't have a lot of conviction, and somehow is always the one who just halfheartedly does things. Passion isn't Mevlut's middle name. Heck, he fell in love to a girl and wrote letters to this girl for three years, and when a girl tries to run away with him so that they can get married, Mevlut goes along, even though he realises that it isn't the girl he fell in love with. I don't know. I just find his personality irritating. If someone does you wrong, how long will be act like the world's punching bag? When would you start complaining? When an opportunity comes, will you grab it, or will you just stand by watching it sail away? These traits seem to be all encapsulated in Mevlut, and it is definitely not my personality type. It is definitely a personality type that I would eventually get tired of waiting, and sooner or later I will just abandon him by the sidewalk. I suppose I just don't deal well with people who like to play the victim all the time. So don't blame me if you end up being a street seller all your lifetime. There have been plenty of opportunities to rise the ranks and elevate your social class, but if all you want to do is sell boza on the streets at night, then so be it. Goodbye. So now I am scratching my head thinking why a novel like this has come out of Orhan Pamuk's brain. But come to think of it, it follows a pattern. I have read several other books of his in the past, and I must say that I used to like them more. 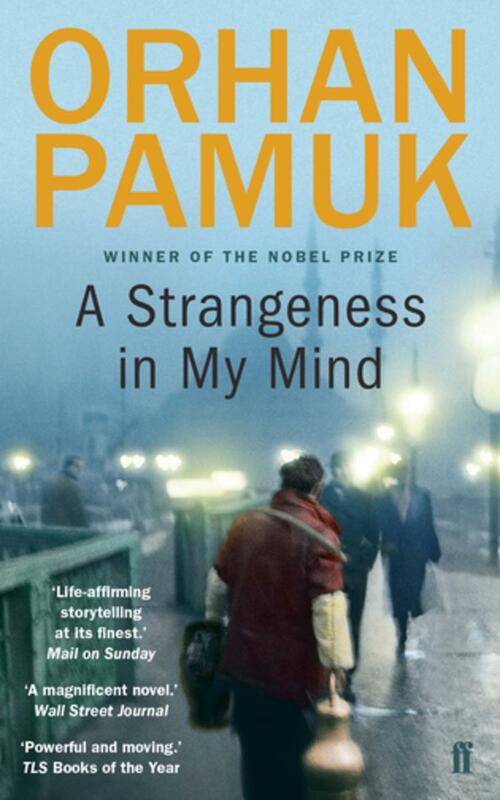 Pamuk typically has these novels where there are multiple narrators, and sure enough, A Strangeness in My Mind is also narrated by multiple characters, in addition to the omniscient narrator. I also reviewed the previous books I have read, and sure enough, there were characters that were lacking in conviction. I remember The Black Book having a character who finds his wife missing one day. Also, in The Museum of Innocence, you find a man, Kemal, who becomes madly in love with a woman he cannot reach, so he builds a museum in her memory. Somehow, Pamuk likes to write about weak men, about hopeless romantics, and Mevlut is no different. Mevlut was in love with Samiha, who he thought was named Rayiha, so when the real Rayiha shows up when they planned to elope, he just throws his hands up in the air and goes with it, marrying a woman he never was in love in the first place. I am not sure I like these characters, moving forward. As I was reading the book, I kept on asking myself, why am I still reading a story about this pathetic character? It was quite boring, frankly speaking. Anyway, the thing I like the most about this book however is how it provides a wonderful narration on how Istanbul evolved over the years. I haven't been to this city, and reading novels set in the city provides me a vicarious access to it. That is definitely something I appreciated. But overall, I am not too enthusiastic about this novel. Only read it if you're a die-hard fan of Pamuk. I give it 2 out of 5 stars.